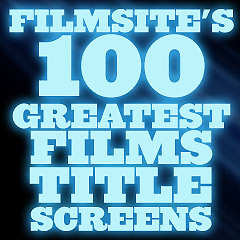 Movie Title Screens - Filmsite's 100 Greatest Films: Title screens are the initial titles, usually projected at the beginning of a film, and following the logos of the film studio. They are often an ignored aspect of films, although they reflect the time period or era of the film, the mood or design of the film, and much more. Filmsite's selection of 100 Greatest Films in the last century of film-making covers - by conscious choice - a wide range of genres, decades, stars and directors. These 100 choices were limited to English-language, theatrically-distributed, narrative feature films. [That means foreign-language films, documentaries, TV movies and mini-series, and short films were not considered.] Emphasis in these selections was purposely directed toward earlier, more classic Hollywood/American films (and other English-language films) than more recent films, although some recent films (and British films) were included. They are film selections that have undoubtedly left an indelible mark upon our lives and reflect the defining moments of the last 100 years - films that give us pieces of time we can never forget.